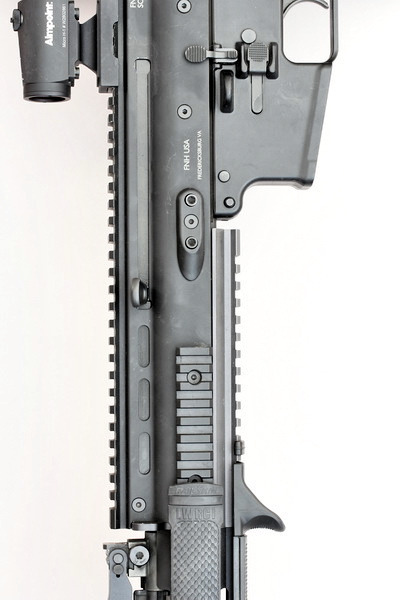 Per the PWS website for the SRX, adds 5" to the total length of the SCAR 16S rail system and the top rail addition adds 2.7" of rail, allowing for the use of the OEM from sight. 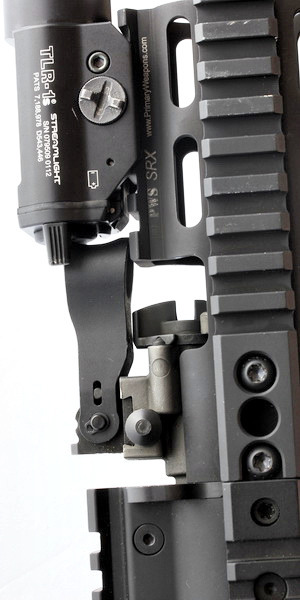 The rail also features two QD mounts for a sling on either side (which I do not use). The weight is 7.9oz. The package, a small white box, contained inside, the extension, a replacement yoke, and two replacement screws (T25) and paper instructions, which can be downloaded. I purchased it from Amazon. The primary reason for purchasing the PWS SRX is because I wanted to get a better grip on the gun, and with a better grip be able to drive the gun, controlling it with greater accuracy. To this end I researched different extensions and originally wanted to get the TangoDown extension rail. Problem was that TangoDown did not produce that rail extension, ever. So the next one on the list was the PWS. I googled a bit and found nothing negative about this rail so I figured it would be worth a try. My only issue with buying this item was with removing the yoke, which was required for the installation. Having done some more research online, and seeing a few youtube videos on the process it was fairly simple to do and only required an inch pound torque wrench, which a mechanic friend had. The install went pretty smoothly. I followed this video which is made by PWS. Only thing I did differently that what the video recommended was I used a safety lighter to heat up the bolts on the SCAR before I took the yoke off. 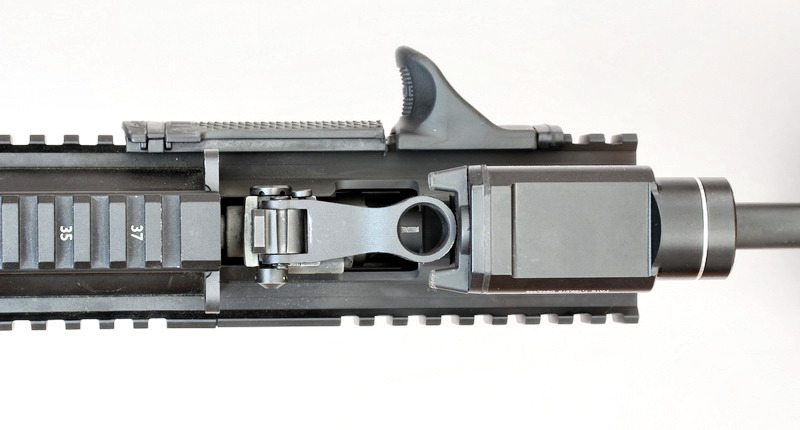 Once installed the rail was very stable and was directly inline with the SCAR OEM rail. I wanted to mount a weapon mounted light at the twelve o'clock position, which this allowed for me to do. 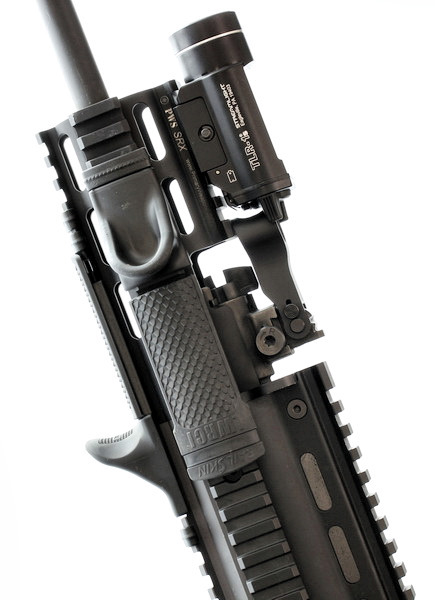 I was going through a few different types of setups, I put a Magpul AFG on the end and it did not feel right. I put a standard vertical grip on it (I have a few different types which I tried out). 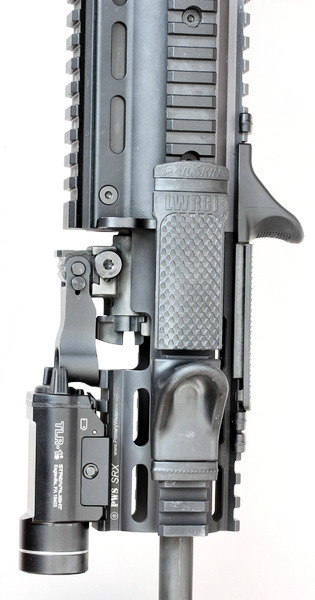 I tried a setup which had the LWRC rail skin covers (pictured below) and they were just too slick. I wanted a push/pull type of setup. 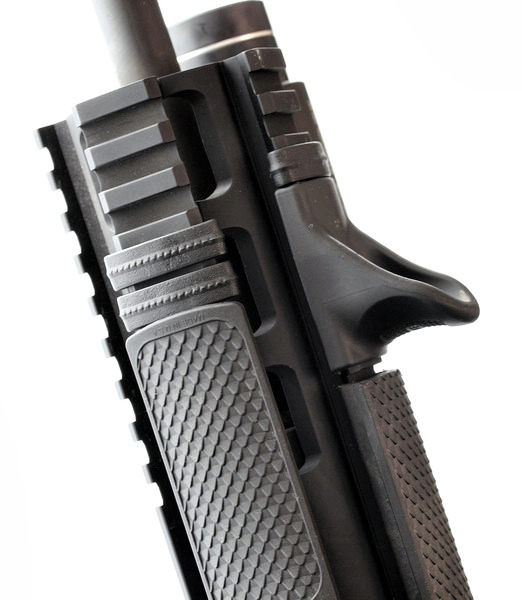 I eventually picked up a pair of LaRue Tactical handstops. After getting the setup together and vetted through dry fire I took it to the range, mainly to re-zero the gun. (since I put a LT751 on my H1 at the same time) When I got to the range the gun was shooting about 5MOA low at 100y. I was going for a 100m zero (why 100m? Read this thread). I figured there maybe some "break in" period for the PWS SRX and since I replaced the yoke I figured there would be an issue with accuracy if I did not torque the T25 screws correctly (62inch/lbs, per instructions), which I did before I went to the range. I got the range and after a mag I was able to zero the SCAR without issue. Dialing in the H1 was easy (I'll be doing a review of the H1 eventually). I took this setup, which was untested in a full days work with the gun to the F2S High Stress Class, which I ran it without issue during the two day ownagefest. The gun ran flawlessly and the rail extension did exactly what I wanted it to do. None of the bolts came loose after the class, I checked the torque on them and they were all to spec. I have wondered sometimes why the SCAR did not come with an extended rail, or at least a factory option when ordering (which I found out that there is a FNH OEM Rail, but its about $80 more than the PWS SRX). While I do not see why the SCAR did not come with the this OEM rail, the PWS SRX seems to work very well as an aftermarket addition. Since installing the PWS SRX I have put right over 3500 rounds through the gun. I have checked the torque of the screws on it a few times, after a few good range trips and it maintains spec. The rail is very modular, in the sense that it will be able to take many different setups. I like the SCAR system and the PWS SRX adds the much needed "space" to it. If you have a SCAR and need extra room to get a good grip on the rifle, or just more real estate for hanging stuff of your gun, then this is definitely a must buy. I am eventually going to SBR my SCAR and put a suppressor on it. This will complicate things as I am not entirely sure of the diameter of the inside of the rail. I will have to figure it out when the time comes, but I am sure I will be able to come up with some sort of solution for it.